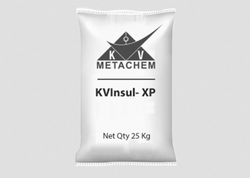 Our product range includes a wide range of kv metachem kv insul-xp silica. KVINSUL XP Silica is a Carbon Neutral product widely used in steel production/ Foundries as Thermal insulation covering compound. KVINSUL XP is a free-flowing, nonhazardous RADEX powder made from Rice Husk Ash as main source of silica and other ingredients. It is also known as a Ladle / Tundish covering compound. KVINSUL XP is being speeded over molten metal which is usually temperature at 1650 o C while in Ladle. It will create a thick layer of about 1¿¿¿- 2¿¿¿over molten metal and helps maintain temperature while being molten metal is being transferred from ladle to tundish. It will prevent the possible breakdown of caster which usually occurs due to drop the temperature. It will prevent the possible breakdown of caster which usually occurs due to drop in temperature. Chemical composition & physical properties are maintained and tested according to industry standards.